ODCS G-2 is responsible for policy formulation, planning, programming, budgeting, management, staff supervision, evaluation, and oversight for intelligence activities for the Department of the Army. Description: "As can be seen from the evening news, the military's intelligence mission is more and more important every day. Global instability remains a constant focus for military intelligence." Description: White Sands Missile Range, N.M. -- The 35 miles per hour wind gusts were hard enough to almost stop the team members in their tracks. The loose sand that had been a constant frustration over the last 24 miles was getting lifted up and blown into their eyes and gasping mouths. Description: The U.S. Army’s Military Intelligence Corps wants to equip its field operatives with a pocket-size tool they can use to locate and identify adversaries, and then disseminate that information to nearby troop commanders as quickly as possible. Description: DURHAM - University of New Hampshire alumnus, Dover native and the Army's deputy chief of staff for intelligence, Lt. Gen. Mary A. Legere, will deliver this year's commencement speech on May 18 at Memorial Field. Description: Kristi and Chief Warrant Officer 3 Scott Hinson, of the 201st Military Intelligence Battalion, 470th MI Brigade, were spotlighted on NBC's "The Today Show," March 26. Description: WASHINGTON, March 13, 2013 – The terror threat is still potent, but it is much more dispersed than it once was, the director of national intelligence told the Senate yesterday. Description: WASHINGTON, March 12, 2013 – Ten years ago, the idea that cyber posed a leading threat against the United States would be laughed at. But no one is laughing any more. Description: WASHINGTON, March 8, 2013 – Engineers, scientists and analysts of the Defense Intelligence Agency’s Missile and Space Intelligence Center provide high-confidence assessments of foreign missile and space systems and other critical intelligence products that help to keep warfighters from harm. Description: Military service members, civilians and friends attend a U.S. Army Intelligence and Security Command and 1st Information Opperation (Land) event held to celebrate the achievements of African Americans in American culture, Feb. 25 at Fort Belvoir, Va. Description: The U.S. Army and its servicemembers have been the targets of threats, internal and external, since its inception as the first Continental Army. Although the names have changed over the years, the threats have not. Description: WASHINGTON, Feb. 22, 2013 – President Barack Obama notified congressional leaders today that the last of 100 U.S. military specialists have deployed to Niger to support intelligence efforts in the region. Description: WASHINGTON (Army News Service, Feb. 11, 2013) -- President Barack Obama placed the Medal of Honor around the neck of former Army Staff Sgt. Clinton Romesha during a ceremony Feb. 11 in the East Room of the White House. Description: YONGSAN, South Korea (Feb. 8, 2013) -- Smart phone owners with access to government computers in South Korea have rapidly become the number one group of cyber security violators in the country. Description: The Army plans additional Gray Eagle units, one for each of 10 active-duty divisions, and several more for special operations units, aerial exploitation units and the National Training Center at Fort Irwin, Calif. Description: Fort Huachuca, AZ. - It was long after the hour of darkness and everyone had left the building for the day. Ever so slowly, the door leading onto the main hall swung open, and, after glancing furtively up and down the corridor, a man dressed in janitor cleaning attire slid out. Description: Fort Huachuca, AZ. - Maj. Gen. Gregg Potter, commanding general, U.S. Army Intelligence Center of Excellence and Fort Huachuca, said his goodbyes to the Soldiers, Families, friends and supporters from Fort Huachuca and the surrounding communities, during the formal relinquishment of command ceremony on Brown Parade Field Thursday. Description: Throughout the history of armed conflict, nations at war have fought to secure advantages which they hoped to tip the scales in their favor. Knowledge of the environment and of the enemy has proven to be a timeless weapon wielded by the eyes of the battlefield. Description: While they might not be the first Soldiers mentioned when discussing Army deployments, cryptologic linguists play a vital role whether at home or abroad. Description: CHARLOTTESVILLE, Va. (Jan. 8, 2013) -- It has been said that eyes are the windows to a person's soul. Additionally though, they are also the gateway to a person's identity. Description: It might be difficult for some to comprehend now, but there was once a time when opposing militaries lined up across from each other on a battlefield and settled their differences in close-range combat. Description: In addition to the exhibitions, GEOINT, which is in its ninth year, hosted several keynote speakers, panel discussions and breakout sessions by government, military and private sector leaders. Description: Army intelligence professionals with U.S. Army Intelligence and Security Command gather to celebrate the continued dedication of the Army Intelligence Corps at the 37th Annual Army Intelligence Ball, Sept. 22, at Arlington, Va. Description: FORT GEORGE G. MEADE, Md. (July 26, 2012) -- Col. Yvette C. Hopkins may be the new commander of the 902nd Military Intelligence Group, but she is no stranger to Fort Meade or the organization. Description: FORT GEORGE G. MEADE, Md. (July 26, 2012) -- Col. Anthony R. Hale took the reigns of leadership of the 704th Military Intelligence Brigade from Col. Karen H. Gibson in a change of command ceremony Tuesday morning on McGlachlin Parade Field. Description: SCHOFIELD BARRACKS -- Col. William J. Mangan took command of the 500th Military Intelligence Brigade on July 17 from Col. Patricia A. Frost at Weyand Field, Schofield Barracks Hawaii. US Army Intelligence and Security Command, Commanding General, Maj. Gen. Stephen G. Fogarty hosted the change of command ceremony. Description: There is no killer app. Understanding the threats and the challenges that confront the United States is complex work," Legere explains. From the Aspen Ideas Festival, the senior Army intelligence officer at the Pentagon outlines the opportunities and dangers new technologies pose in conflicts around the world. This video is part of a new series on the Atlantic Video channel, The Future of X, looking at what's on the horizon for culture, technology, business, and politics. Description: FORT GEORGE G. MEADE, Md. (June 21, 2012) -- For the first time in the unit's short history, the 780th Military Intelligence Brigade welcomed a new commander. Description: The face of the US military is changing. Today, women make up more than 14 percent of the nation’s armed forces, and the Department of Defense recently announced its intent to open up over 14,000 combat-related positions to women. What new opportunities do women have in today’s military? How do women succeed in a still predominately male environment? And how have their lives, families, health, and the transition to being veterans been impacted? Title: Technology of War: What Does the War of the Future Look Like? 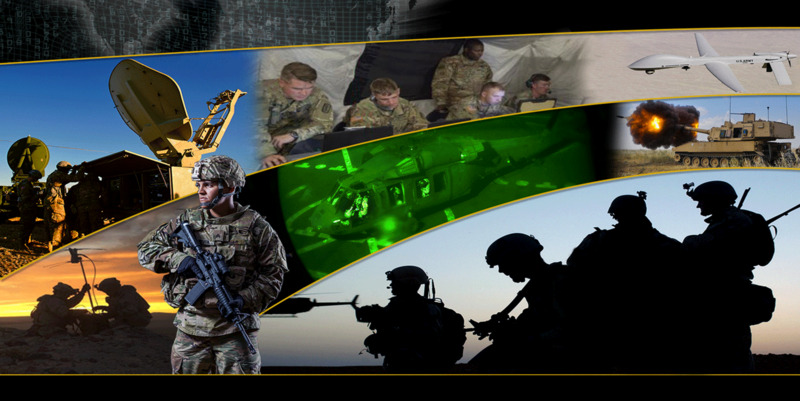 Description: Technology continues to transform military capabilities. Rather than a revolution of military affairs, the US military is evolving as technologies change. Has cyber warfare, remote sensing, drone attacks, unmanned combat vehicles, and the speed of information made the soldier obsolete in an increasingly “antiseptic” theater of war? What does the war of the future look like, and are we equipped to triumph?